Deadline for submission of all proposals is April 30, 2016 at 11:59pm EST. Improve recruitment and retention of underrepresented students, researchers and faculty members. The conference includes plenary discussions and presentations by expert researchers, evaluators and activist scholars. The conference also includes multiple opportunities for networking and connecting rising investigators to senior scholars, evaluators and researchers. The Latina Researchers Conference brings scholars, researchers and aspiring investigators from across the U.S. to address the underrepresentation of diverse scholars in research activities. Participants include research scientists, evaluators, academicians, higher education administrators, graduate students and various members of professional organizations and research institutes. Federal agencies, institutes and funders as well as leaders in philanthropy are also invited to attend. Early Career Investigator Poster Sessions: Early career investigators (doctorate degree within 7 years) and doctoral or terminal masters candidates are invited to present qualitative or quantitative research that is relevant to the general themes of the conference. University of the Incarnate Word students are strongly encouraged to apply. First authors will be considered to receive a travel award to subsidize conference expenses. Submissions should consist of a summary (75-word limit) and abstract (300-word limit) to be used for anonymous peer review. Please include the following headings in the abstract: introduction, methods (including analytic sample, measures and data analysis), findings and conclusion. For more general guidelines on poster submissions, please see below. Research Symposium (90 min): A symposium consists of three qualitative or quantitative research paper presentations organized around the general themes of the conference. The Symposium should also include a Chair to introduce the topic and a Discussant to conclude the session. The Chair/Discussant do not present separate presentations but rather integrate and highlight important aspects of the presentations and session. Early career investigators are welcome to apply and will be considered for an Early Career Investigator Symposium. Submissions should consist of a summary of the symposium (75-word limit) and an abstract for each presentation (300-word limit). Please include the following headings in the individual abstracts: introduction, methods (including analytic sample, measures/procedures and data analysis), findings and conclusion. Presenters are highly encouraged to integrate 10 minutes Q&A to conclude the session. For more general guidelines on submissions, please see below. Skill-building workshop (120 min): Skill-building workshops focus on topics relevant to recruitment and retention of underrepresented graduate students and early career investigators in research and academia (e.g., applying to graduate school, successful grant applications, steps toward securing tenure, etc.). Submissions should consist of a summary (75-word limit) and abstract (300-word limit). Please include the following in the abstract: introduction/background, overview of workshop, expected results and conclusion. Three learning objectives (100 characters or less per objective) should also be submitted (not included in 300-word count limit). Skill-building workshops may include up to three presenters. Curriculum vitae of all presenters must be emailed to LatinaResearchersConference@gmail.com upon submission. Please include “Skill Workshop CV” in subject line. For more general guidelines on submissions, please see below. New — Evaluation workshop (120 min) These evaluation workshops feature actual program evaluations with an emphasis on sharing evaluation methodology and practice in diverse communities. All evaluations must include a component of community/stakeholder engagement in the evaluation process. This includes a process whereby the participants of the program being evaluated helped to shape the logic model for the evaluation, the evaluation design as well as informed the evaluation questions addressed. The proposals in this section must reflect culturally responsive approaches to evaluation that emphasize the issues of importance to program practitioners and other stakeholders in the evaluation setting and not only on decision makers. Submissions should consist of a summary (75-word limit) and abstract (300-word limit). Please include the following in the abstract: introduction/background, overview of workshop, expected results and conclusion. Three learning objectives (100 characters or less per objective) should also be submitted (not included in 300-word count limit). Evaluation workshops may include up to three presenters. Curriculum vitae of all presenters must be emailed to LatinaResearchersConference@gmail.com upon submission. Please include “Evaluation Workshop CV” in subject line. For more general guidelines on submissions, please see below. New — STEM-building workshop (120 min): STEM-building workshops focus on topics relevant to the themes of the conference as they relate to the areas of Science, Technology, Engineering and Math and highlight innovative research strategies and approaches specific to STEM areas of study. Submissions should consist of a summary (75-word limit) and abstract (300-word limit). Please include the following in the abstract: introduction/background, overview of workshop, expected results and conclusion. Three learning objectives (100 characters or less per objective) should also be submitted (not included in 300-word count limit). STEM-building workshops may include up to three presenters. 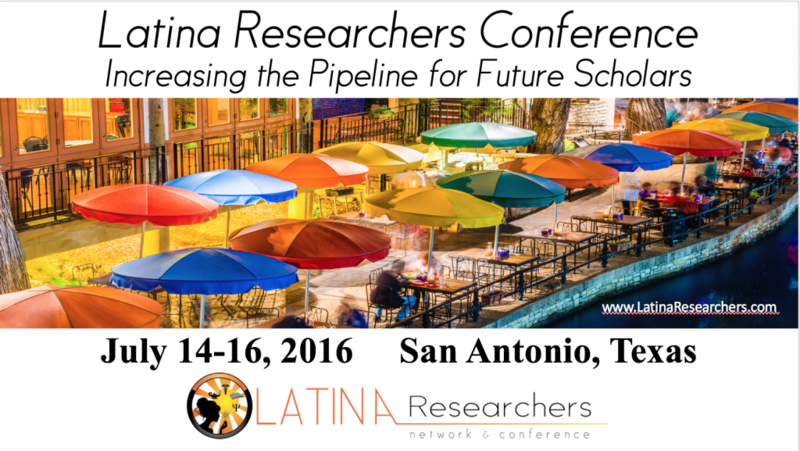 Curriculum vitae of all presenters must be emailed to LatinaResearchersConference@gmail.com upon submission. Please include “STEM Workshop CV” in subject line. For more general guidelines on submissions, please see below. Plática Hour (60 min): Plática hours are facilitated discussions that provide an opportunity to more deeply engage participants around issues relevant to the general themes of the conference. Early career investigators are welcome to apply and will be considered for an Early Career Plática Hour. Submissions should consist of a summary (75-word limit) and abstract (300-word limit). Please include the following in the summary: introduction/rational, overview and aims of the Plática Hour. Three learning objectives (100 characters or less per objective) should also be submitted (not included in 300-word count limit). For more general guidelines on submissions, please see below. Abstract submissions open March 16, 2016. There is a limit of two proposals per first author. Notification of acceptance will be made to the corresponding author. Latino, Pipeline, STEM, students. Bookmark. Copyright © 2015 Dr. Silvia Mazzula, All rights reserved.